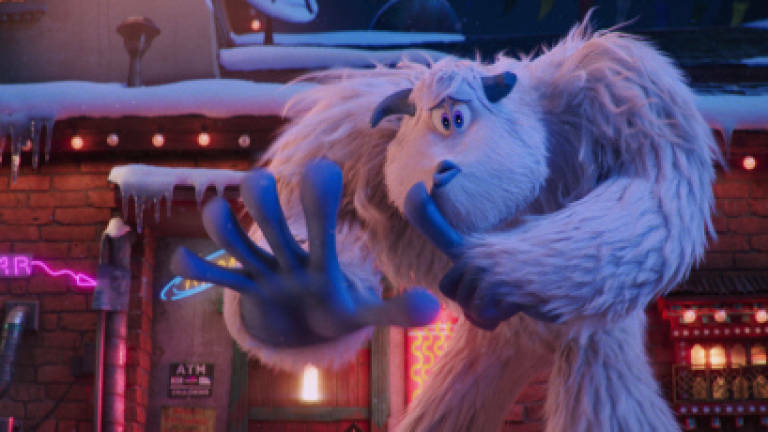 02 Oct 2018 / 09:22 H.
THOUGH not as hyped up as animated films from other major studios, there is still something special about Smallfoot. It begins with our protagonist, a Yeti named Migo (voiced by Channing Tatum), narrating about life in his village high up in the Himalayas, with his fellow Yeti who go about their daily lives believing that their home is on top of a mountain held up by giant mammoths that reside beneath some thick clouds, and there is nothing beneath that. Everything about their history is written on pieces of stone, and even if some of their beliefs are a little over the top, Migo chooses to go along. In fact, his dream job is to take over his father (Danny De Vito)’s position as the Yeti who is catapulted head first at the gong each day so that the golden snail (the sun) will come out each morning. It is a simple village with simple inhabitants, overseen by Stonekeeper (Common) who is a stickler for rules. All that changes when Migo witnesses a plane crash and sees its pilot, a human aka Smallfoot, a mythical creature that he and his villagers were told doesn’t exist. He naturally tells his entire village but as luck would have it, he has no proof. When he refuses to admit that he is wrong, Migo is banished from the village. He falls in with the S.E.S. (Smallfoot Evidentiary Society) run by Stonekeeper’s daughter Meechee (Zendaya), and three village misfits Gwangi (Lebron James), Kolka (Gina Rodriguez), and Flem (Ely Henry), who believe him and offer to help. Then, Migo accidentally falls through the clouds to the land below, and runs into Percy (James Corden), an animal TV show host who is so down on his luck, he tries to produce a fake video of a Yeti encounter in order to be popular again. The rest of the story is made up of hilarious situations the characters find themselves in, due to miscommunication (and misplaced intentions). There is also a very short dramatic moment about Yeti history, and an ending that will keep the children happy. There are some good songs too, but the stand out is the omnious rap by the Stonekeeper. All in, this is a fun film that the whole family can enjoy.